Are you feeding your dog properly? More specifically are you feeding the right food, the right amount of food, and at the right times? Whether you own a Goldendoodle or Great Dane, it’s important to know the main facts of dog nutrition. We’re here to help with all the need-to-know information you need for filling up your pet pooch’s dog bowl with wet food or kibble. What Should Your Dog Eat? When considering dog nutrition, it’s important to consider what your dog should and shouldn’t eat in order to meet all its nutritional needs. Here are some of the best options. Dogs are often a big fan of canned/wet dog food. This type of food is easy to find at places like brick & mortar supermarkets and online retailers like Amazon. The food has a long shelf life, so it’s an expedient choice during cold winter months, for example, when it’s tougher to get to your local grocery store. That said, a related issue is canned dog food can be quite expensive and especially the gourmet type. Is it worth the price? Make sure a commercial canned food provides enough pup protein. In particular, check how much “digestible protein” a dog food has. This goes through your dog’s digestive system but isn’t broken down into useless absorbable nutrients. This option includes raw meat, and it’s better with raw (not cooked) bones for calcium and phosphorous. It should also have some organs mixed in. A raw diet is a good option for several dogs since they have strong stomach acids and short intestinal tracts. Both of these biological features make it easier for dogs to consume/digest raw food. However, make sure to consult your veterinarian before starting your dog on a raw diet. They can inform you about the benefits and risks involved with this option so you can choose wisely based on your dog’s age, breed, and health. Dry dog food is the most economical option among the different kinds of dog food. This explains why it’s quite common among pet owners. Another significant benefit is it has a long shelf life and doesn’t have to be refrigerated. Kibble can provide your dog with various health benefits. For example, it keeps your dog’s teeth healthy since the crunchy food helps to lower tartar buildup. Here’s how to pick a particular dry food. First, read the product’s ingredients list. Pick a brand that mostly uses natural/organic ingredients. This provides the best nutritional value for your pet pooch. If you’re a pet owner who wants 100% control your dog’s diet, then this is a good option. This gives you the ability to know everything your dog eats and make sure it’s getting all its nutritional needs. The main drawback of this option is it takes more time, effort, and money when it’s meal time. However, many dog owners believe it’s worth it. Make sure to do your homework to learn the basics about canine nutrition so you’ll know what to add to the home cooked chow and how much of it. This type of dog foods includes ones that are shaped like meaty foods, e.g., burgers or pork chops. As you might guess this type of dog food is the least nutritional kind. It might also contain several artificial colors/flavors. Semi-moist dog food is a tasty treat for your dog. However, it shouldn’t be part of your dog’s daily diet. The reason your pet pooch won’t be getting all the nutrients they need, and that’s definitely a bad thing. How Much Should Your Dog Eat? Figuring out how much to feed your dog isn’t an exact science. It involves issues like the dog’s size, type of food, how often they eat, how regularly they exercise, and so on. Here are some basic guidelines about how much to feed your dog in a 24-hour period. As a general rule, you should feed adult dogs 2x and puppies 3x+. Make sure to do the math to figure out the amount of each serving. You should also determine how active your mutt is. This might require you to tweak how much to feed your dog daily. The next step is to use a body condition scoring system. This helps to fine-tune how much you’ll need to feed your dog. You should monitor your dog every 2 to 4 weeks and keep a written record of the results. In the case, your dog is quickly gaining/losing weight/fat tweak the portion sizes. What does a healthy body look like? It should have an “hourglass” shape when looked at from above. The hips/chest should be wider than the stomach. When looking at the dog from the side, it should look “tucked up.” In other words, the dog’s chest should be closer to the stomach than the belly when it’s standing. Finally, the ribs shouldn’t be visible but felt easily when putting a little pressure. 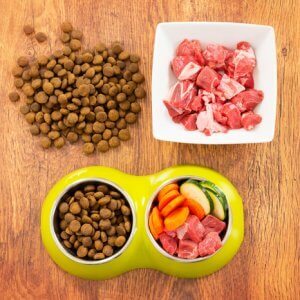 Make sure when you change your dog’s food you’ll have to start this process all over again to make sure your dog is getting the right amount of grub. Finally, if you have any questions about your dog’s health/diet make sure to consult your pet’s veterinarian. They can help figure out the amount of food it should be eating based on the particular situation. Carbs are a macronutrient like protein and fats. It’s made of starches, sugars, and fiber. Dogs can synthesize blood sugar from various dietary protein/fat, but carbs are the only macronutrient that’s not “essential” for dogs. So if they’re not essential what makes carbs important for dogs? The reason is carbs are the primary source of glucose or the “fuel” the body runs on. So while carbs aren’t an essential nutrient for pooches healthy carbs provide essential vitamins, minerals, and other nutrients that help to optimize dogs’ health. Some sources of carbs in dog food include fruits, veggies, beans, and grains. When your dog is consuming energy from healthy carbohydrates, this saves protein for other critical functions. When picking a commercial dog food make sure to avoid “junk” carbohydrates. The problem is they quickly boost levels of blood sugar but provide your mutt with little nutrition. When we think of fat, it usually has bad connotations. However, “good” fat is quite beneficial for canines. There are several good options including fish, sunflower, flaxseed, and olive oil. One significant benefit of fat is it provides 2x the number of calories vs. carbs and protein. Make sure to look for foods that are high in omega-3 and omega-6 fatty acids. This includes low-mercury fish and plant-based oils like olive and flaxseed oils. You should also consider the quality of fats in dog food. Sometimes companies add low-grade fat to kibble to improve the flavor. Both types of minerals are important for a dog’s nutrition, but macrominerals are required at higher levels than microminerals. One factor to consider is growing puppies need 2x the calcium as adult dogs. Watching the calcium/phosphorus levels in big-breed puppies is important. This helps to prevent the risk of certain foot diseases. This is the most critical macronutrient for dogs. When selecting a commercial dog food select one that lists its primary protein source first. Protein provides several benefits including the health of bones, hair, muscles, nails, and skin. Protein is also crucial for things like enzymes, hormones, neurotransmitters, etc. This macronutrient makes sure the dog has an ample supply of amino acids, which are protein’s building blocks. Protein sources can include animals and plants. Animal sources include meat, eggs, and milk. Plant-based protein sources include beans and lentils. We know vitamins are essential but what exactly are they and which ones does Fido need? These organic compounds contain carbon and dogs need small amounts for metabolic function. The two main types of vitamins are water-soluble and fat-soluble. Dogs are unable to synthesize large amounts of vitamins. So it’s vital for them to originate from their feeding. Vitamins provide important features including blood circulation, nervous system, and immune system. Warning: if you feed your dog “complete and balanced” food make sure not to add extra fat-soluble vitamins since this can cause a toxic effect. This is less likely a problem with water-soluble vitamins since the dog excretes additional amounts through urine. The best source for these vitamins is real foods. So when picking a dog food make sure the food not only includes these vitamins but that they’re also sourced directly from food. Besides buying natural/organic dog food, another option is to prepare DIY food. This way you’ll know about the source of 100% of the food’s ingredients. You can also make sure the food doesn’t have artificial additives like colors, flavors, and preservatives. Fresh is best! All plants and animals need water and dogs are no exception. The body of an adult dog’s body consists of 70% to 80% water. Water has many functions like hydrolyzing protein/carbs/fat, regulating body temperature, flushing out waste, and cushioning the nervous system. Make sure to provide fresh/clean water to your dog 1-2x/day. Tap faucets with a quality filter are the best source for man’s best friend. While it might be tough to find elk and beaver meat for your canine the point is to provide your dog with different protein sources if possible. That, in turn, will provide them with different amino acids and other nutrients. Fun Fact: Wolves hunt in packs and use signals/turns to catch prey that is usually faster. Wolves also eat some fruits and vegetables to stay healthy. Protein is the most critical macronutrient for dogs, but they also need some carbs and fats. These are the basics of dog nutrition. You know the fundamentals of what, when, and how to feed your pet pooch. A distant relative of the world’s first domesticated animal will thank you with a wolf! What Are The Nutritional Needs Of A German Shepherd? Why Make Homemade Dog Food: 13 Easy Recipes for Beginners!